The cost of building sea barriers that would protect New York City and parts of New Jersey from storm surges is likely to run as high as $23 billion, according to the Dutch scientist commissioned by New York City to study how it might respond to the extreme weather events and rising sea levels brought about by climate change. The cost estimate has caused sticker shock among some elected officials, most notably New York City Mayor Michael Bloomberg, who has bristled at the proposal, even after Superstorm Sandy flooded vast swaths of Coney Island, Lower Manhattan and Queens and left 43 people dead. 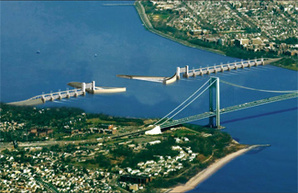 Artist's concept of how a 4,800-foot storm surge barrier might look next to the Verrazano-Narrows Bridge in New York Harbor. Drawing courtesy of Arcadis. But a groundswell of public backing for the concept, combined with an estimated $50 billion in storm-related damages, means support is forming for close scrutiny of the likely costs and benefits of constructing sea barriers in New York Harbor. Jeroen Aerts, a professor of water and climate risk at VU University Amsterdam, who is the scientist leading the study, said interest in the project before Hurricane Sandy was "low, very low. Really, extremely low." "This is not to blame the U.S. or the city whatsoever," he added. "This has to do with looking into the future and to incorporate forward looking into your daily practices. This is difficult, especially for policymakers." Hurricane Katrina was a wake-up call for New Orleans, said Aerts, "and apparently it takes Hurricane Sandy to make people aware that New York City is also vulnerable." In 2011, when Hurricane Irene prompted officials to evacuate 400,000 New York residents, Aerts was asked by the New York City Department of City Planning to conduct a cost-benefit analysis of constructing storm surge barriers like those in his home country, the Netherlands. The department requested that he also evaluate the ways in which current land use and building codes might be amended in order to improve the city's adaptive capacity and build its resilience to climate change. The cheapest scenario, he said, includes two barriers: a large structure between Sandy Hook and the Rockaways and smaller one at the northern part of the East River. He estimated that these would cost roughly $10 billion. The other strategy, he said, involves the construction of three or four barriers: one across Arthur Kill, the narrow strait between Staten Island and New Jersey; one across the Verrazano Narrows; one in the East River; and possibly another running across Jamaica Bay. That scenario, he said, would cost "a maximum of $17 billion." Aerts explained that these estimates do not include the costs of building up coastal protection outside of the barrier. Once the storm gates are closed, everything inside the barrier is protected from storm surges. Outside those barriers, though, levees and sand dunes would need to be constructed in order to keep back not only the initial storm surge but also the water that would otherwise flow into the areas behind the sea barriers. Aerts estimated that 25 miles of coastal protection would need to be constructed, adding as much as $15 billion to the cost of building the barriers. Further study, he said, needs to be done of "the side effects" of building a barrier, such as the ecological impacts on inland estuaries and coastal marshes. The barriers are technologically feasible, he said, but the primary obstacle will be securing the financing and navigating the complex and overlapping regulatory structure that involves multiple local, state and federal agencies. City Council Speaker Christine Quinn on Tuesday announced a $20 billion proposal for improving New York City's climate change preparedness. In addition to investing in subway, sewage and electrical grid protection, the plan calls for fast-tracking Aerts' study. As part of the speaker's proposal, New York Sen. Charles Schumer (D) will lead an effort in the U.S. Congress to tap the Army Corps of Engineers to conduct a study into the feasibility of constructing sea surge barriers around New York City. Quinn is a front-runner in the 2013 mayor's race, and her proposal offers a hint that disaster response and climate change may be central topics in the contest to succeed Bloomberg. In announcing the proposal, Quinn pointed out that sea surge barriers have been built along the Dutch coast and in London's portion of the River Thames. She also described how engineers in Stamford, Conn., "with the click of a mouse, brought a storm surge gate rising up from the water as Sandy approached." The Connecticut barrier was built following a strong hurricane that hit in 1938. "It's now crystal clear that we need to build protective structures," she said. "This is really a giant step forward," said Robert Trentlyon, a resident of Lower Manhattan's Chelsea neighborhood and for many years a leader in a citizen effort to build support for the construction of a sea barrier. Trentlyon has secured the backing of many Manhattan community boards, the advisory groups appointed by each of New York City's borough presidents, and championed the concept at City Council meetings. Sandy flooded most of Lower Manhattan, including several subway and vehicle tunnels, and knocked out power south of 39th Street on the eastern side of the island and south of 31st Street on the western side. "We have a lot of support for this," he said. What happens when the memory fades? Aerts will travel to New York City in December to present his preliminary findings to city officials and at a gathering of scientists. He said the report will be finished by the summer of 2013. "In a few months' time, the discussion will be different," warned Aerts. "Now the memory is fresh. In a few months' time, there will be another crisis. The mess has been cleaned up. The people in Breezy Point may have a new home. And suddenly the discussion becomes different." The environmental lobby and people concerned that storm surge barriers will compromise their view will be the primary opponents, he said. "I cannot predict exactly what will happen," said Aerts, "but I do think that costs and benefits are really a technical approach. In the end, it's really the sentiments and the emotions of people that play a big role, and politicians are very sensitive to those emotions in society."